The “elbow,” Or the Lower Cape, includes the towns of Eastham, Chatham, Orleans, and Brewster. Squeezed between the Atlantic waters of the Cape Cod National Seashore, this area runs the length of the eastern side and includes the more protected Cape Cod Bay. 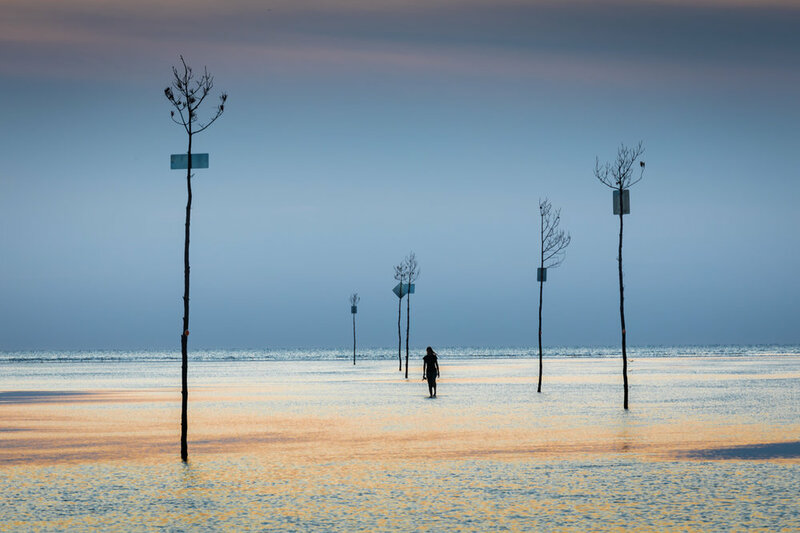 From the the unique seascape of "clam trees" of Rock Harbor at sunset, to the ethereal night sky over Stage Harbor, this evening workshop will satisfy your appetite for capturing the landscapes of the Cape in the best light. If you're looking to improve your sunset and low-light photography this one's for you. Standing and walking on a combination of surfaces, including deep sand, pavement, and gravel is normal and wading through knee deep water is and option. The hike to Stage Harbor is about a mile through soft sand and the walk to the boat house is about 15 minutes on a sand path. The workshop starts at 4 PM on 9/29 and the meeting location is the free parking lot for the Cape Cod National Seashore Salt Pond Visitor’s Center. You can use the address 50 Nauset Road in Eastham or the GPS coordinates of 41.8374, -69.9719. David will be at the ramp leading up to the front door with his tripod up. If you are a beginner and would like to participate in an introductory primer on photography, please arrive by 3:30 on 9/29. Dave has been practicing digital environmental landscape photography for the last ten years, and film for many more. From the mountains of New Hampshire and Vermont to the seacoast locations of Maine and Massachusetts, he looks for iconic images during the best seasons with incredible light. He strives for each photograph to communicate not only what is seen, but also how the location makes you feel. Dave is a member of the Boston Camera Club where he was the 2018 Photographer of the Year. He has won numerous awards including the Appalachian Mountain Club’s Image of the Year. His images have been featured in Cape Cod Magazine 20th Anniversary Edition, the 2018 Guide to Boston, St. Augustine Social Magazine and Visit Central Mass Guide. Dave is also a blog contributor for Datacolor Photography Calibration Company. Dave lives in Shrewsbury, MA and speaks at camera clubs throughout New England. He has published several e-books (available in our store) for self-guided tours of New England locations. See his work online at www.davelongphoto.com and on Instagram. If you are looking for accommodations for this workshop, use the town “Eastham, MA” for a city. This workshop is not overnight, but ends very late. We highly suggest booking a hotel for the evenings of June 5 or September 29 and booking sooner than later for the best options.